Coenraad Herman van Es was born in 1876 as one of seven children of Salomon Abraham Levie van Es and Carolina van der Wijk. In 1904 he married Eva van de Rhoer (born 24th of March 1875, daughter of Abraham van de Rhoer and Matje Glazer and was the sister of a number of the Van de Rhoers in Meppel). They had two children: Carolina Mathilda (born on the 21th of August 1905) and Abraham (born on the 10th of December 1908). Eva died in 1930 and two years later Coenraad remarried, this time to Eva’s younger sister Schoontje, born on the 18th of July 1889. 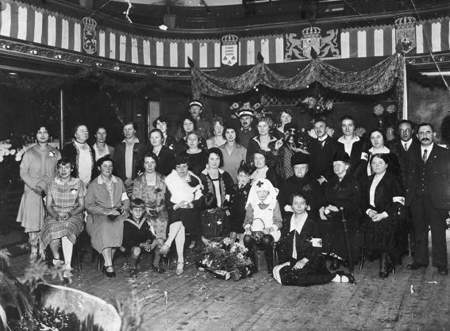 The church- and the civil ceremony took place on the same day, 15th of July 1932. They had no children. Coenraad van Es, his wife Schoontje and daughter Carolina lived at 5 Steenwijkerstraatweg. Carolina worked as a secretary for Brocades & Stheeman. When, at the beginning of 1942 this was no longer possible, she got a job as secretary with the Jewish Council. Her brother Abraham (Bram) had already moved to work and live in Amsterdam. 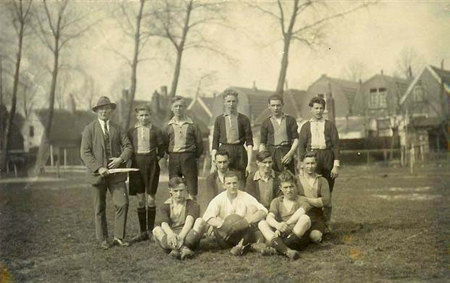 Bram van Es (standing 4th left) played soccer in one of the adult teams of Alcides in 1925. 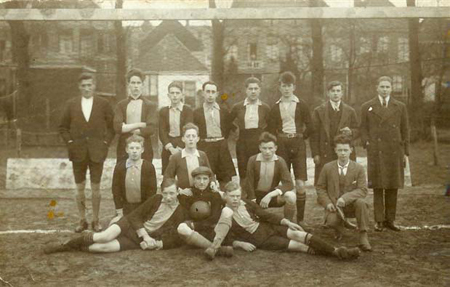 This picture was taken on the playing field 'Weerdstraat'. 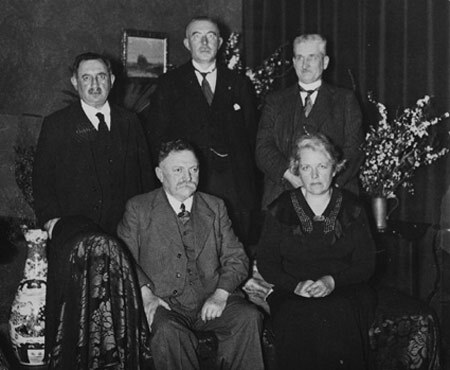 Back row, middle: Coenraad van Es, a respected member of the Red Cross in Meppel. Like all the other schools the ‘Akker’ school also had a play break at ten thirty, for a quarter of an hour. In this time some of the children had to help the teacher to get the books ready for the next lesson. Of course this was done at great speed so that the few minutes left could be used for more interesting business. One day Engel Strik laid out the reading books for Mr Goedgebure. While sliding from one bench to another on his socks he suddenly got a giant splinter (7cm. long and 1cm. wide) in his foot. Engel squealed like a pig, creating some panic. Goedgebure did not have a clue what to do, but his colleague van Es kept his head cool. He sent one of the bigger boys to the cobbler Mr. van Tiel to get a pair of pincers. Then the operation could begin. Two teachers held the patient down and Mr van Es performed the operation by using the pincers to take out the piece of wood from Engel’s foot, who was screaming terribly. Engel had to stay at home for more than ten weeks with an infected foot. Because of this event the Municipal council of Meppel granted a generous credit for the purchase of slippers for the pupils at the ‘Akker’ school who wore clogs. For many years the splinter was kept at the school. Not as a relic, but as an instructive example for the pupils, which was then customary. after that at the Noorderschool. I can still see school master van Es, as he walked next to ‘his’ children his coat tails fluttering, in the Queen’s Birthday parade, singing with them: ‘We live free, we live happy on our beloved Dutch soil. Probably one of his best qualities was the fact that he had a sober look on life. I worked seven years as a typist at the Jewish Firm of L. J. Frank (Steamboat quay); they were traders in tropical fruits and bakery commodities. I can still remember the first day of the War. I was walking with Mr van Es (who was a part time accountant in the company) to the office. Tears were rolling down his cheeks and he said to me: ‘Marie it’s finished; first we go and then you all. As to the first, he would be proved right, unfortunately. He was soon confronted with the plans of the Germans, because one of the first measures of the Germans was sacking all Jewish teachers. He was teaching at the Noorder School then, which meant he would have been made redundant, but with the help of the town council this was prevented. Because van Es was only one year from retirement, he was offered early retirement. The reason given was ‘[…] that the applicant was no longer fit by sickness to perform his task as a teacher’. He accepted the ‘offer’! His ‘unsuitability’ probably was a result of the fact, that over the years he had become rather deaf and maybe that is the reason he no longer could teach properly. Not much later, there was worse news. Associations wanting to be considered for council grants should dismiss their Jewish committee members. This regulation came into practice at the beginning of 1941; Coenraad van Es then still had a position with the Association for Infant Food and Clothing and with the Central Society for the Recovery and Holiday Colonies for Children. The chairman – secretary J. Ph. 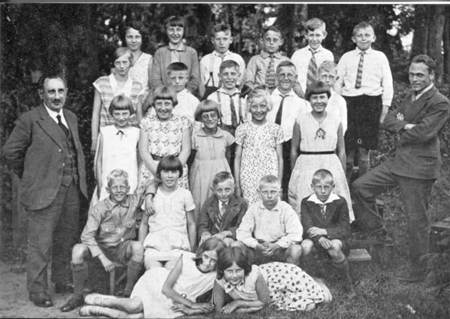 Kuipers (Association for Infant Food and Clothing), and the secretary G. Assendorp (Central Society for the Recovery and Holiday Colonies for Children) hurriedly declared that C.H. van Es had laid down his function as a committee member. It is remarkable to see how easily they let their colleague down. Association to provide Food and Clothing for Children in Meppel. Jules Leijdesdorff, went into hiding and survived the War. A few weeks later (the 24th of April 1941) Coenraad handed in his radio at the Police station at Hagenstraat. In those days it was forbidden for Jews to possess a radio. Apparently this experience put him one step ahead of the Germans; he had learned his lesson from their behaviour, so before he was obliged to hand in his bicycle he thought of a cunning trick; he sold the bicycles of himself and his wife to family A. de Wolde for the sum of fl 175,-! 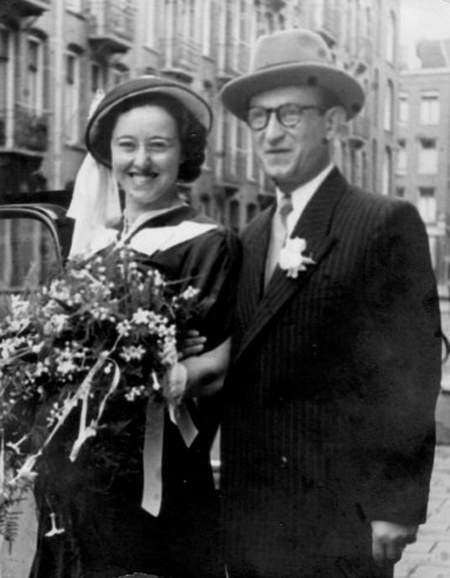 Martha van de Rhoer and Bram van Es on their wedding day in 1942. After some time, the van Es family felt more and more pressure . Many Jews, including son Bram, were sent to a labour camp. Thursday the 10th of June 1942, Coenraad reported to the Police that a bicycle, which he had sent to his son, had gone missing during transport to labour camp Vledder, where his son worked as a cook. Luckily, it seemed to have been a misunderstanding; the bicycle was found unattended in Ruinen. The retired teacher C.v.E reported to the police that a bicycle, given for transport to a local carrier did not reach its destination. The police have traced the bicycle. On the 12th of September Bram lost something again; this time a suitcase with contents. Unexpectedly he had to move from camp Vledder to camp Orvelte and was unable to bring his suitcase with him, so he decided to hand over the suitcase to a stranger, asking him if he could send the suitcase to his parents in Meppel. It never arrived and Bram suspected a colleague (De Bruin), the cook at the labour camp Vledder of stealing it. Father van Es asked the police to investigate the matter, but without any result. In those days all Jews had to hand over all their possessions to Liro. Coenraad realised that it was only a matter of time before his wife, daughter and himself would be transported, so he took every precaution that the Germans would not lay their hands on all his possessions. I received from Mr H. v.d. Belt, Meppel, 8 Emmastraat, a sum of fl 2.700,- Two thousand and seven hundred Guilders worth of shares, belonging to C. H. van Es, kept in trust by the above-mentioned Van de Belt. Most probably very little went to Liro, because at the Liquidation of this institute in 1951, only the sum of fl 777,29 in favour of the Van Es Family was found. A part of the possessions was kept safe, but for the family itself that was not the case. On the 3th of October 1942 father, mother and daughter were taken out of their house and taken to Westerbork. In the meantime son Bram was married to Martha van de Rhoer, and after various Labour camps, Bram as well arrived in Westerbork, where he met his parents again and his wife. Everything went rather fast: on the 9th of October Coenraad, Schoontje and Carolina together with other Meppel Jews were transported to Auschwitz and were all killed on the 12th of October. After two years in Camp Westerbork, Bram and Martha were transported to Theresienstadt in 1944. After three weeks Bram was deported to Auschwitz, where he was killed. Martha survived Theresienstadt; she was liberated by the Russians and returned to the Netherlands with a French Canadian division. After the family had been removed on the 3th of October, their house was cleared out and sealed and on the 26th of October it was made available to the Wehrmacht (armed forces). Probably not for long, as in 1943 the building was sold for fl 4.500,- to Mr A. Boverhof, a café owner in Vledder, who thought that as an NSB (the Dutch National Socialist Movement) member he would be entitled to own this house. 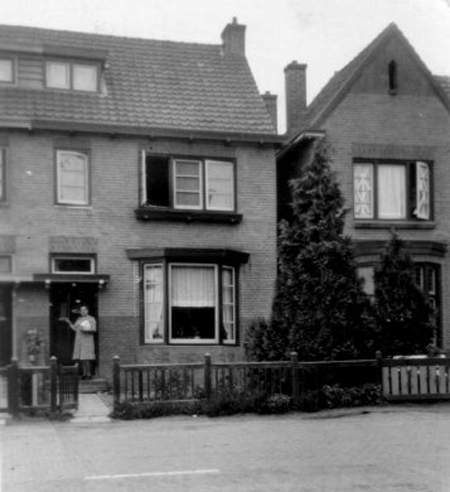 Schoontje van Es-van de Rhoer in front of her neighbours house on Steenwijkerstraatweg.